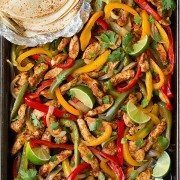 Chicken fajitas in soup form! 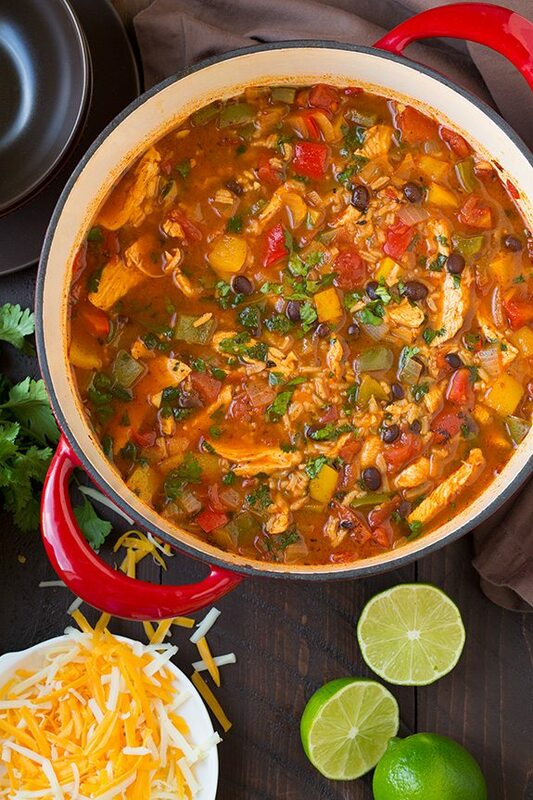 This is such a filling and flavorful soup and you’ll love these tasty Tex-Mex flavors. It’s loaded with chicken, rice, black beans and veggies. Yet one more thing I had to try in soup form, because it is fall after all! I’ve always loved chicken fajitas and I love soup just as much so the two are just meant to come together right? I’ve already made this soup twice in two weeks! 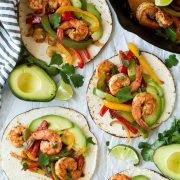 It’s easy to make and it’s packed with all the flavors of classic chicken fajitas. To keep it hearty and filling I decided to add rice and black bean, and I personally like tomatoes on my fajitas (I make my fajitas more like a taco and load on the toppings) so you’ll also find the tomatoes here. And I went with the fire roasted to help gives this soup that classic charred fajita flavor. Every now and then I’ll get a comment on some of my recipes that have 1 – 2 Tbsp of chili powder in them with people saying it was too spicy. If you aren’t used to chili powder you may find this chicken fajita soup a little spicy (also be sure not to buy hot chili powder). This soup wasn’t too spicy for my mom or kids who don’t like spicy foods, so hopefully it’s not for any of you. And as a side note, I used 2/3 of a yellow, red and green bell pepper instead of just using 2. Only for more color but I didn’t want to confuse anyone so I’d just thought I’d throw it out there. More Soup Recipes You’ll Love! 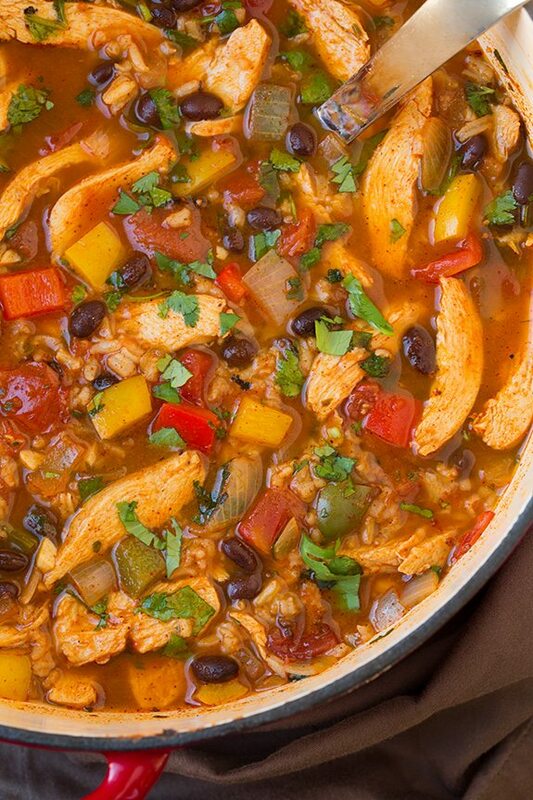 Chicken fajitas in soup form! 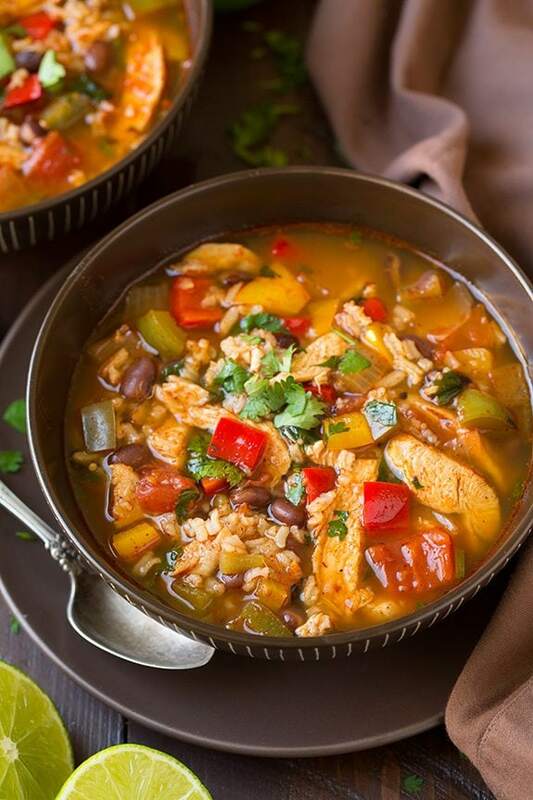 This is such a filling and flavorful soup and you'll love these tasty Tex-Mex flavors. 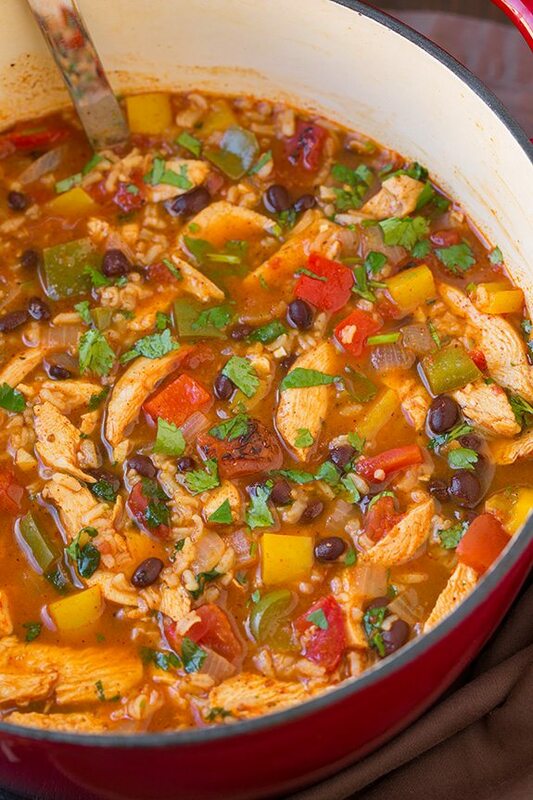 It's loaded with chicken, rice, black beans and veggies. Prepare rice according to directions listed on package. Meanwhile, heat olive oil in a large pot over medium-high heat. Add bell peppers and onion and saute 3 minutes then add garlic and saute 1 minute longer. Pour in chicken broth and diced tomatoes. Stir in chili powder, ancho chili powder, cumin, paprika, oregano and season with salt and pepper to taste. Add chicken and bring to a light boil. Reduce heat to medium-low, cover and simmer until chicken has cooked through (chicken should register 165 degrees in center on an instant read thermometer), about 10 - 15 minutes. Transfer chicken to a cutting board (while continuing to cook soup mixture to soften veggies) and let chicken rest 5 minutes, then cut into small strips. Return chicken to soup, stir in cooked rice (see notes), black beans, cilantro and lime juice. Serve warm with cheese and sour cream if desired. If you don't plan on serving the whole pot of soup right away, don't add the rice. It will being to absorb the broth as it rests so just add the rice to each serving.